"Thank you so much, you guys do a great work. I manage an animal hospital in Miami. 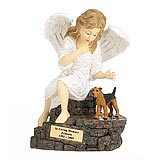 I know how important it is for me to be sensitive to a pet owner in this time of loss. Now it's my turn to say good-bye to 13 years of my dog. " 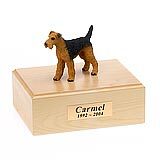 All available Airedale Terrier dog urns and memorials will be displayed with the figurine on the Airedale Terrier urn you select and in the appropriate size.